With the weakening remnants of former-hurricane Jose stirring off the east coast, and Hurricane Maria still slowly churning through the Caribbean, the skies are all clear for our home state of Connecticut's biggest in-water boat show this weekend - the Norwalk Boat Show. 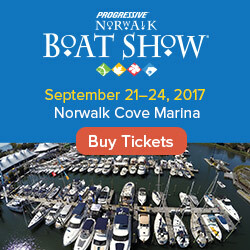 The 2017 Progressive Insurance Norwalk Boat Show, the Northeast’s premier in-water boating event, docks at Norwalk Cove Marina this weekend through Sunday, September 24, 2017, offering water lovers an all-access pass to discover why life is better with a boat. Thousands of boating novices and lifelong enthusiasts can check out the newest introductions and best deals of the season with exclusive show specials and competitive bargains on hundreds of boats, plus thousands of the latest marine accessories. From luxury yachts and center console sportfishers to affordable family cruisers, the Norwalk Boat Show is the ultimate destination to shop and compare 300 boats side by side in a beautiful waterfront setting. 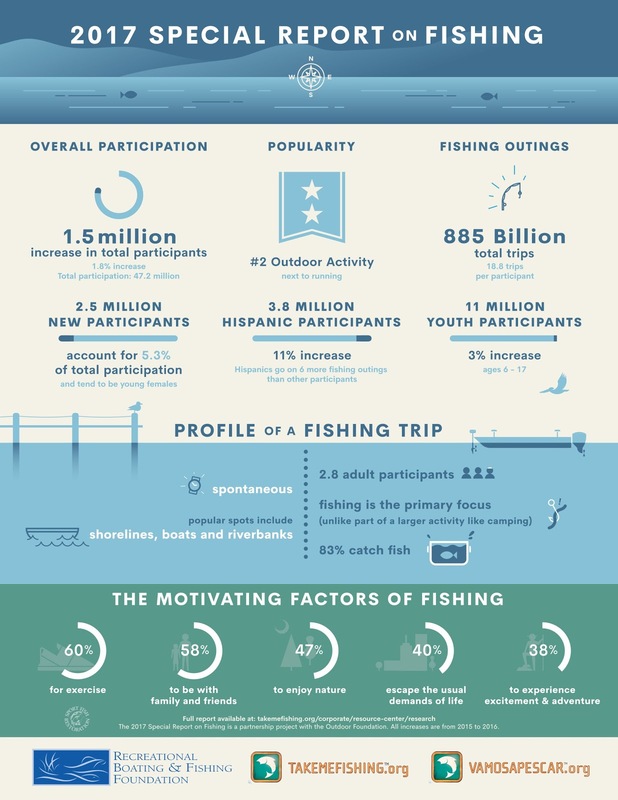 In addition to boats and accessories, attendees can enjoy the last days of summer on Long Island Sound with kayaking at Try it Cove, boating lessons with seasoned captains and fun for the whole family at the new Touch-a-Boat event for kids, plus free boat rides, live music and much more. TICKETS: Tickets are $15 for adults; children 12 and under get in FREE when accompanied by a paid adult. INFO: For more information, visit BoatShowNorwalk.com. 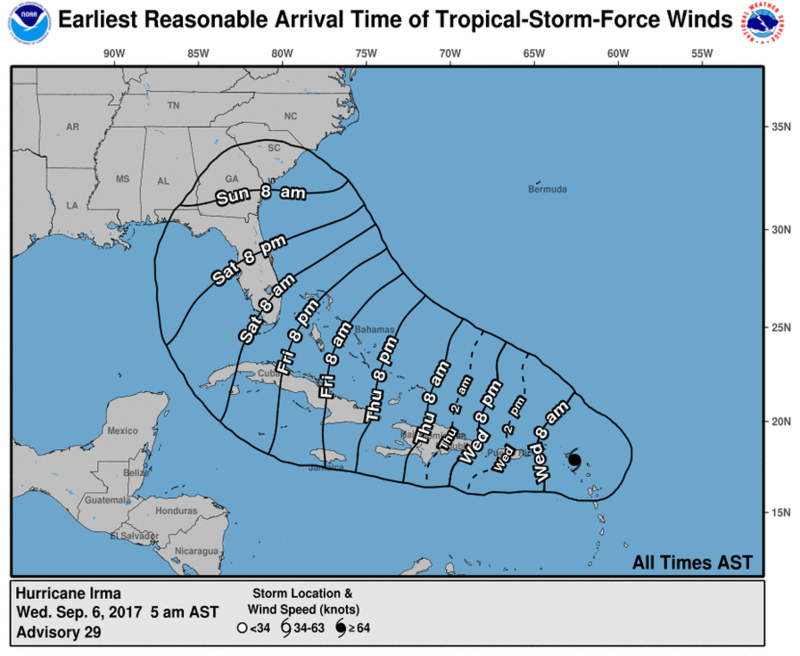 Potential impact of Hurricane Irma forces organizers to postpone event. New dates are October 13-15, 2017. The National Marine Manufacturers Association (NMMA) put out the following statement yesterday, and it was the right thing to do. Take a look at this image from the National Hurricane Center and you'll see the Tampa area could face over 60 mph winds on Saturday, which would typically be the boat show's busiest day. 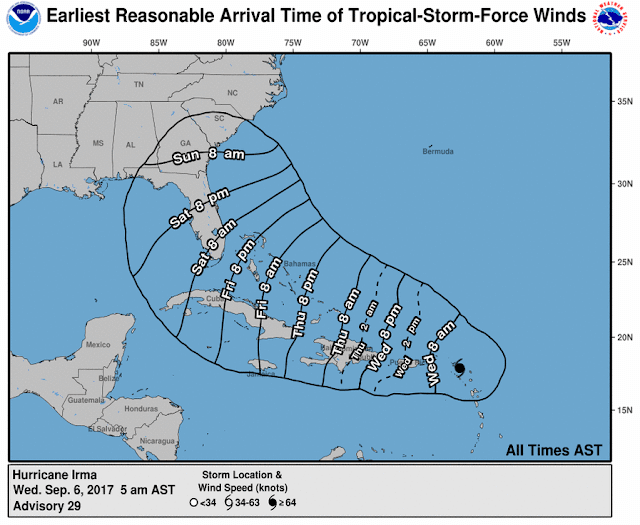 As of this post, the Category 5 hurricane, which some news outlets are saying is the most powerful storm ever recorded in the Atlantic Ocean, is delivering 185 mph winds across the Caribbean.The Florida Keys are currently being evacuated as the storm is on track to hit the Sunshine State this weekend. Out of an abundance of caution and to protect the safety of our exhibitors, partners, and attendees, NMMA has postponed the Progressive® Insurance Tampa Boat Show to October 13 - 15 as Hurricane Irma potentially threatens the Tampa region. The show was originally scheduled for this weekend, September 8 - 10, 2017. Pre-purchased tickets will be honored during the new dates. Please visit TampaBoatShow.com with questions. Members, colleagues and stakeholders in the path of Hurricane Irma, please stay safe. You and your families are in our thoughts. 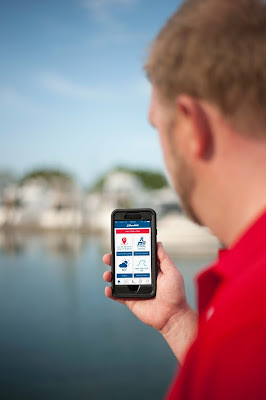 In addition to helping any recreational boater call for a tow or soft ungrounding; get tide, weather, and marine conditions; or share your location with friends and family, the New BoatUS App now offers a hurricane-alert feature just in time for peak storm season. 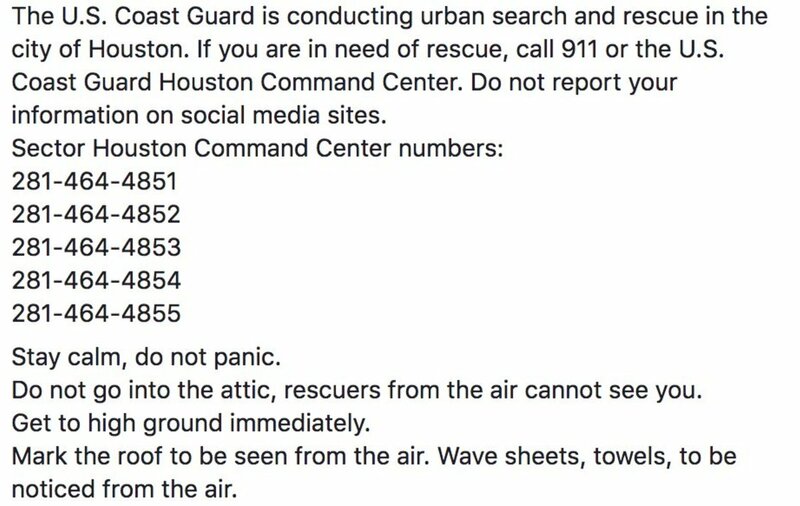 To download the free updated app, go to BoatUS.com/app. We received the following presser from Cowes after the kick-off of the Rolex Fastnet Race...It's an exciting, historic, competitive international race, but basically we really liked the pictures (courtesy of Rolex.com). Following months of meticulous preparation for crews and organizers alike, a record-breaking edition of the Rolex Fastnet Race is underway and in some style. The largest fleet in the race’s 92-year history, comprising 368 yachts from 29 countries, were treated to kind conditions, blue skies and a consistent, building westerly breeze as they were divided across seven start sequences in front of the Royal Yacht Squadron’s clubhouse in Cowes. The 2017 Rolex Fastnet Race fleet is truly diverse, a quality clearly evident to all of those watching on the shore in Cowes or the thousands following the live start of the race on the internet. First away were the nine multihulls with the MOD70 Concise 10 immediately asserting her status as favourite to arrive first in Plymouth. Speaking before the race skipper Ned Collier Wakefield was comfortable with this prediction, less so of setting a new race record. 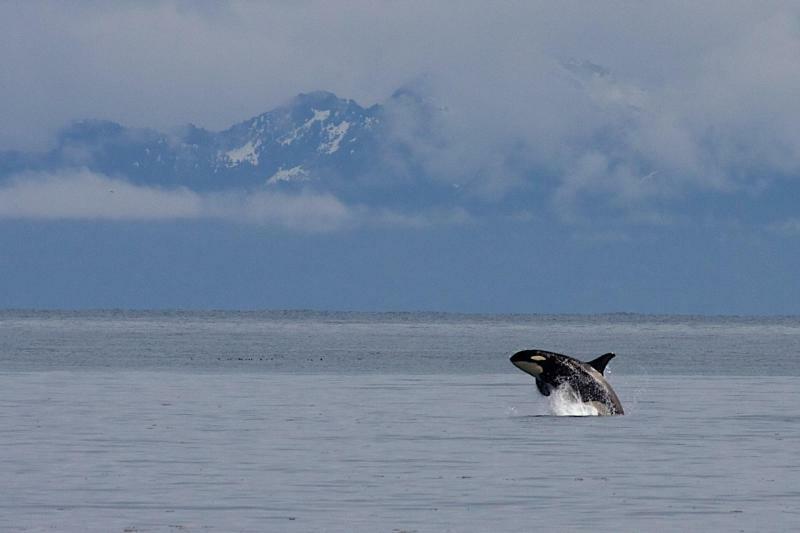 “The forecast has got a little slower. It’s not looking like record breaking conditions. We are expecting a 48-hour race.” The current multihull line honours record stands at 32 hours, 48 minutes. Following the departure of the multihulls, the subsequent starts provided a showcase for a range of boats from cutting-edge to historic, professionally-sailed to family-crewed, the IMOCA 60s, Class 40s, through to the bulk of the fleet embodied by yachts in the 30-50-ft range including a large number sailing double-handed. The final start was reserved for the largest and fastest monohulls. In this class, the range of designs and size of yachts is remarkable. At 115-ft Nikata, a high-performance cruising yacht, has become the largest monohull to ever compete in the race. Her nearest rival in size, Ludde Ingvall’s 100-ft CQS, was built with the more single-minded objective of racing fast. “CQS consists of a lot of different and radical ideas at the same time,” explains Ingvall. “It’s a very interesting boat and we are still learning a lot.” Ingvall was the last skipper to claim line honours and overall victory in the same year. That 1995 success is one he self-deprecatingly puts down to ‘getting lucky with the weather’. George David’s Rambler 88 is an offshore racing yacht par excellence and has the added experience of finishing the last edition of the race. The final starting group also comprised the seven competing Volvo 65s. The general consensus among weather forecasters points to a ‘big boat race’, with good breeze on the upwind leg to the Fastnet rock before a cold front sets in heralding lighter conditions which may thwart the ambitions of the chasing fleet in their quest to claim the Fastnet Challenge Trophy and Rolex timepiece awarded to the overall race winner on IRC handicap. The Rolex Fastnet Race, organized by the Royal Ocean Racing Club (RORC), is considered the world’s largest and most diverse offshore race. It is one of three 600-nm offshore races partnered by Rolex. The others are October’s increasingly popular 608-nm Rolex Middle Sea Race and the legendary 628-nm Rolex Sydney Hobart Yacht Race held annually at the end of the year. We found several great gifts for under $40, and highlighted a few of them below. Read on to check them out, or jump straight to their Mother's Day Boutique . 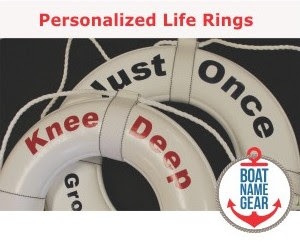 With hundreds of items available, most including personalization, you are sure to find the perfect boat name gift for the yacht mama in your family. There's nothing like an outdoor show to kick off the boating season. This one is especially unique - it's a boutique show, featuring a mix of new and brokerage boats of virtually all sizes and styles. Unlike a lot of boat shows in the area not located in Newport, this event actually includes sailboats among its exhibits. And did we mention this show is located on an island? Below is the full press release about the show courtesy of WindCheck Magazine. We really hope you get the chance to experience this show. 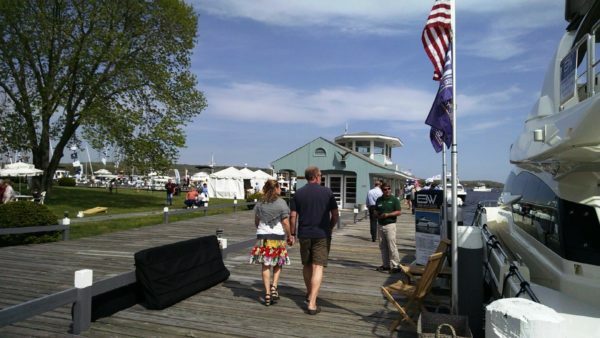 The Connecticut Spring Boat Show has announced the 2nd Annual 2017 in-water show dates of May 5-7, 2017 at Brewer Essex Island Marina located in Essex, CT. 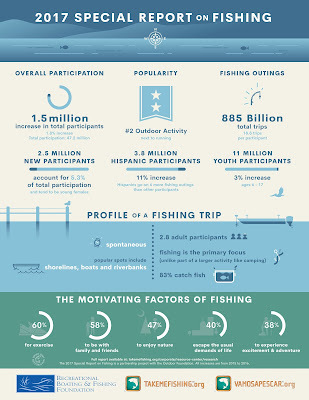 The Boating Industry has come together to unveil some of the latest innovations in boating, offer purchase incentives and give consumers an ideal opportunity to compare different boats, dealers and options in one convenient location. 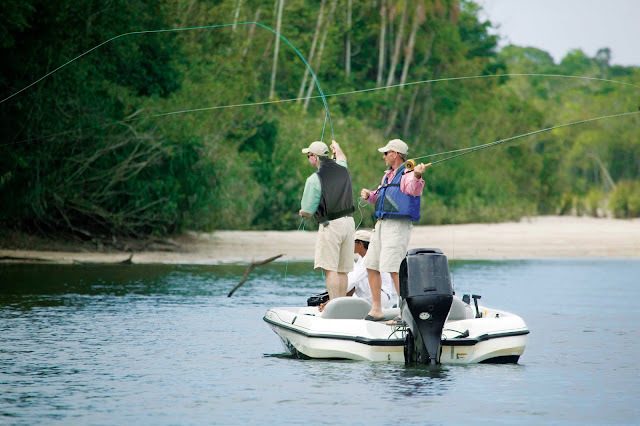 Interested boat buyers will enjoy select opportunities for sea trials throughout the weekend; thus giving prospective buyers a unique ‘try-before-you-buy’ experience. We expect more than 3000 people to attend the free show, rain or shine. Visitors attending the boat show will enjoy seeing a wide range of new and brokerage, power and sail models of all sizes, 10ft to larger than 60ft including family cruisers, performance boats, downeast trawlers, day sailers, picnic, center consoles, runabouts, pontoon and inflatables. Boat lines from American Tug, Beneteau, Bennington, Catalina, Chris Craft, Comitti, Cutwater, Defever, Dufour, Eastbay, Elan, Ferretti, Fortier, Grand Banks, Hinckley, Hunt, Legacy, Nordic Tug, Novatec, Ocean Alexander, Post, Rossiter, Sabre, San Juan, Sea Ray, Southport, Tiara, True North, Velasco, Windy, X-Yachts, and more will be represented. Brewer Essex Island Marina is located on a 13-acre private Island, accompanied by a complementary ferry service, and offers 125 slips accommodating vessels up to 200’. The resort marina is family friendly and the popular Marley’s Café will be open for the weekend offering food and beverages with a portion of sales proceeds to be donated to Sails Up 4 Cancer. In addition to the general event, a lively ‘Cinco de Mayo’ celebration is planned for May 5th from 5-7pm and will feature live Caribbean music and fare. Historical Downtown Essex is located on the Connecticut River, a few short miles from Long Island Sound. The small waterfront town is a boating, sailing and tourist destination featuring quaint shops, markets, and restaurants. Bring your family and friends out to enjoy this boat show. 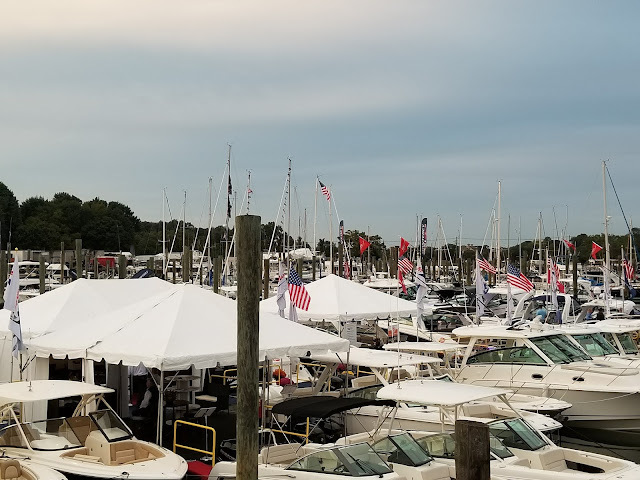 The show is a production of WindCheck Magazine and is sponsored by Brewer Essex Island Marina, Essex Boat Works, Yacht Brokers Association of America (YBAA) and YachtWorld. Visit www.ctspringboatshow.com for specific event details. The man who has provided a soundtrack to our nautical lifestyle for much of our entire lives is now opening a housing resort for adults of a certain age. That's right, Jimmy Buffett is opening a retirement community. Margaritaville Holdings and Minto Communities announced a partnership that will develop new active adult communities in some of the nation’s most popular destinations. The first location of the all-new residential concept will open in Daytona Beach, Florida. The Sales Center at LATITUDE MARGARITAVILLE, Daytona Beach has already broken ground and is slated to open in Fall 2017. 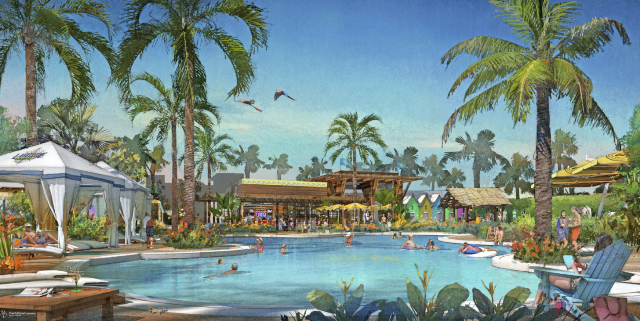 Featuring world-class amenities and design, LATITUDE MARGARITAVILLE, Daytona Beach will reflect Margaritaville’s authentic, “no worries,” tropical vibe, offering an immersive brand experience. Current plans call for walkable neighborhoods and a Town Center featuring a fitness center with an aerobics studio, indoor lap pool, spa, and group fitness classes; indoor and outdoor dining with signature Margaritaville food and beverage concepts, as well as others; arts and learning programs for residents and guests; and a resort pool area with beach entry. In true Margaritaville fashion, music will also play an important part in the community, with a band shell for live entertainment in the Town Center. A private beachfront club with breathtaking views and beachfront amenities will be set on the Atlantic Ocean, which residents can access via a continuous loop shuttle service. With an ideal location in Daytona Beach at LPGA Blvd. and I-95, the destination offers access to the area’s world-famous beaches; championship golf at LPGA International; Daytona International Speedway; Daytona Beach International Airport; the new Daytona One entertainment, dining and shopping destination; and much more. Additional details on plans are expected later this year. For more information please visit www.LatitudeMargaritaville.com. Last week at a luncheon that took place at the New York Yacht Club in Manhattan, Caleb Paine and Daniela Moroz were presented the US Sailing Rolex Yachtsman and Yachtswoman of the Year awards, respectively, for 2016. For the second consecutive year both Paine (26, San Diego), an Olympic medalist, and Moroz (16, Lafayette, Calif.), a prodigy in an up and coming sport, were first-time winners of the coveted awards that have been presented since 1961. The winners were selected by a blue ribbon panel of sailing journalists and media and each was presented a Rolex Oyster Perpetual Yacht-Master timepiece and a framed print of them from US Sailing. Moroz went one step better by becoming the youngest to ever win the male or female award. Moroz was 15 years old last year—she turned 16 last month—when she burst onto the kitesurfing scene and ascended to the top step of the winner’s podium. The awards celebrate the accomplishments of the winners from the previous calendar year. Moroz and Paine were among 18 nominees for both awards who reflect the variety sailing offers as a sport for the ages.